Here is a comic partly about pet names! You should be able to decipher this one, hopefully. Here is another romantic comic strip! A fair amount of the work put into this one was spent on trying to spell “Tumultuous”. Adorable! For best effect, be sure to save your reading of this comic to just as the date changes from the 13th to the 14th. Hm, probably the least romantic romance comic I’ve made so far. 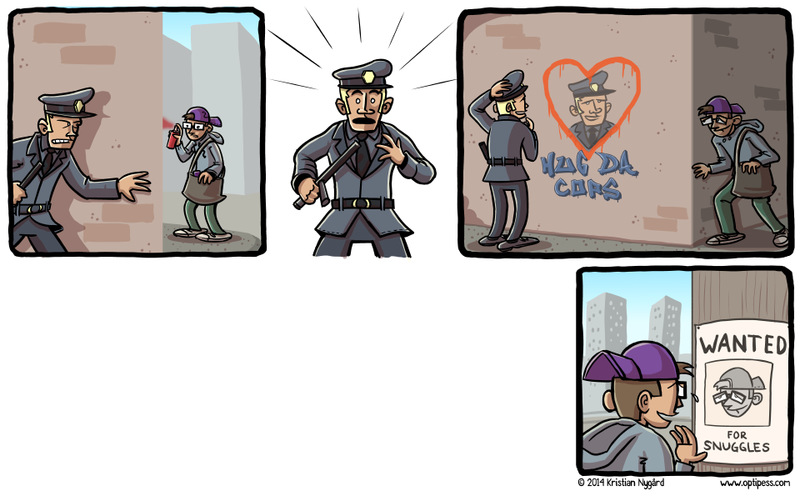 Aw, easily the most romantic comic since the previous most romantic comic! This comic strip was made in the past, unveiled for you to read right now in the present! Also, check out some more time travel comics. Here is a comic! It proves that it is never too late to ask. Aw, adorable! This was the beginning of a beautiful friendship. Aww! Please keep this comic in mind the next time you brutally murder an insect arachnid that just happened to end up in your close proximity. Hmm, I should probably have made a “Satan” tag by now. I’ll get right on it after this 12 hour long nap. Oh hey, look! Here is a post-Valentine’s Day comic for the rest of us. Also, here is another comic from the archives with the exact same name! Let’s start Valentine’s week with this beautiful depiction of a beautiful meeting. I’m pretty sure it doesn’t get more romantic than that if you’re into that sort of stuff. Hello! This comic is about romance and why you shouldn’t strive for it. Hey! Here is a comic strip. It is very educational.